Fig. 1. (a),(b): Temperature dependence of the Ra and Rb at various pressures. (c): P-T phase diagram of ZrTe3. The blue and red triangles are Tc obtained from the Ra and Rb measurements, respectively. 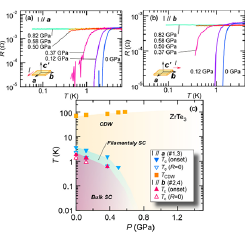 Up to now, the coexistence and competition between charge density waves (CDWs) and superconductivity (SC) have attracted much attention in transition-metal di- and trichalcogenides. Among these compounds, ZrTe3 shows the highly anisotropic SC transition, where the resistance along the a axis, Ra, is reduced at 4 K but those along the b axis, Rb, and c' axis, Rc' are reduced at 2 K. This unusual behavior can be explained by two scenarios, conventional superconducting fluctuation and SC induced by locally bound electron pairs (local pairs). In the former, the reduction in Ra is attributed to a fluctuation in the bulk SC enhanced by the low dimensionality. In the latter, the transitions of Ra and Rb,c’ correspond to filamentary (highly one dimensional: 1D) and bulk (3D) SC, which originate from the formation of local pairs, namely bi-polarons, and Cooper pairs induced by the transfer of the local pairs, respectively. However, at this moment, it remains unclear which interpretation is acceptable. In this work , to understand SC in more detail, we discuss the influence of pressure and the magnetic field on the SC, as determined via Ra and Rb measurements. In the measurements, the samples with different current configurations were mounted on the same sample holder and piston-cylinder-type cell, and the data were simultaneously taken. Figures 1 (a) and (b) show the Ra and Rb at various pressures in the low temperature region, respectively. For P = 0 GPa, the Ra drops to zero at 2.2 K, while the Rb decreases to zero at 1.4 K. The highly anisotropic SC transitions are reflected by 1D and bulk nature of the SC. A P-T phase diagram can be constructed from the data, as shown in Fig. 1(c). Strikingly, the Tc of the bulk SC also decreases in the same manner as that of the 1D SC. This means that the origin of the bulk SC can be related to that of the 1D SC. To investigate the connection between 1D and bulk SC further, we show that the pressure dependence of Hc2 of the 1D SC is similar to that of the bulk SC. These similarities indicate that the origin of the bulk SC can be related to that of the 1D SC. Moreover, in analysis of the excess conductivity, our results are in good agreement with the 1D Aslamazov-Larkin model rather than the 3D model, for both the I configurations, suggesting that the conventional fluctuation theory is not appropriate for our data. These findings favor the local-pair-induced SC scenario rather than conventional SC. According to the local-pair induction scenario, 1D SC is attributed to the formation of local pairs owing to a peculiar electronic structure after the CDW transition. The formation of the ordinary Cooper pairs in the bulk SC is induced by the transfer of the local pairs in addition to the 1D SC. This mixing of two kinds of SC, that is, the unconventional mechanism of the bulk SC increases the complexity of the fluctuation phenomena, which may explain the unusual excess conductivity. Moreover, this picture is consistent with the previous studies, such as anomalous behavior of the specific heat . S. Tsuchiya, K. Matsubayashi, K. Yamaya, S. Takayanagi, S. Tanda, and Y Uwatoko, New J. Phys. 19, 063004 (2017). K. Yamaya, S. Takayanagi, and S. Tanda, Phys. Rev. B 85, 184513 (2012).